Char-Broil’s Classic 300 produces 30,000 BTU of cooking heat on two individually controlled burners, fuelled by a liquid propane tank that is kept in the storage are beneath the main cooking area. Two metal side-shelves provide extra food preparation surfaces, and fold away to decrease the storage needed for the unit. Ideal for small families, the Classic 300 provides 300 square-inches of primary cooking area, and has an additional 120 square-inches of porcelain-coated swing-away rack space for keeping food warm. As is typical with this kind of grill, the unit comes unassembled, and customers were impressed at how easy the unit was to build. On average, it appears that this grill take about an hour to build. The unit is very compact, and its side shelves fold down meaning it’s easy to store. The liquid propane tank fits snugly inside a hideaway compartment maintaining a tidy look. Customers were also impressed with the four locking caster wheels that make moving this lightweight unit is very easy indeed. Rust doesn’t seem to be an issue with this grill as long as it is kept dry underneath and rain-cover. Overall, customers seem to be impressed with the quality of the components of the Classic 300. People who bought this product said that the hideaway door was particularly robust and the double-magnet latch prevented the door from swinging open when it wasn’t wanted. 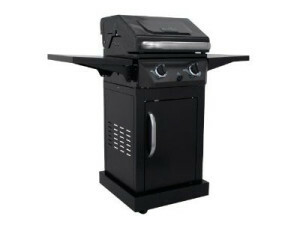 Customers seem impressed with performance of this grill while cooking. The automatic ignition system, powered by three AAA batteries, is robust and works well. The 300 square-inch grill-rack seems to be adequate for feeding a small family a few times a week. Coupled with the 120 square-inch swing-away rack, it is easy to cook for more people. The individually controlled burners can be used one at a time for indirect roasting, or to cook for one or two people, which increases the fuel efficiency of this grill. Customers also like the fact that the grill-racks are very easy to clean, with no customers complaining about premature rusting. However, it has been mentioned that the fat collected in the firebox leaks out of the back of the unit, which it shouldn’t do. Also, customers have remarked that the heat distribution is poor and that only the rear portion of the cooking area gets to a sufficient heat reducing the overall cooking area by about half. Overall, this unit seems to represent very good value for money, particularly for a small family. Keeping the unit dry seems to be key in maintaining the Classic 300’s longevity.